There is plenty of optimism surrounding the global economy. The Eurozone’s surprise recovery in 2017 has created confidence for the year ahead, and even Mr Draghi, the President of the European Central Bank (ECB), signed off the year with a more optimistic outlook. In fact, the IMF think economic growth in the Eurozone will reach 2.2% this year, its best performance in a decade and in stark contrast to their forecast for growth in the UK of 1.5%. Meanwhile, the economies in France, Germany and Spain are starting to pick up pace. Over the pond, The Federal Reserve increased the benchmark interest rate in the United States by 0.25% to a range between 1.25% and 1.5% in December, the third hike in a year. The US economy is also expected to put in a strong performance with growth forecast at 2.7% in 2018, partly thanks to Trump’s tax cuts and also the expectation for unemployment to fall below 4%. All the excitement overseas has contributed to the UK’s FTSE 100 reaching a record in January. The FTSE 100 is the share index of the top 100 companies listed on the London Stock Exchange and is often seen as an indicator of prosperity and confidence in the UK economy. The FTSE 100 has partly been boosted by cheap money from the Bank of England which has helped inflate asset prices, but low interest rates have also pushed investors into riskier assets in the search of higher returns. However, a lot of the companies in the FTSE 100 are big international companies who earn their money in foreign currencies, so the weak pound has helped boost their earnings further. Therefore, the index isn’t necessarily the best indicator for the performance of the UK economy, but it helps. With global growth predicted to rise in 2018, driven by the Eurozone and emerging economies, it’s likely we’ll continue to see headlines about index records being set over the next year. THE city’s first purpose-built rented accommodation block has been given planning permission. Lendlease and Evans Property Group were given the green-light to go ahead with their plans for 196 one and two bedroom apartments by City of York Council this month. The development will be the last chapter the major Hungate regeneration scheme, and developers say it is a “real coup” to make a start on the first purpose-built rental block in York. The new flats will be made up of studios, one- and two-bedroom apartments and the new building will also have a bike space for each flat, a communal lounge, 24-hour concierge, gym, courtyard, and rooftop terrace with Minster views. Commercial space is also being developed on the ground floor and finishing this phase will lead to the completion of the new public space – St John’s Square. The eight-storey development is being designed by architects specialising in “build-to-rent”, he added. Lendlease’s head of residential Richard Cook said: “York has a shortage of quality rental stock. Construction is due to start later this year, with completion anticipated in 2020. The new project is part of the wider Hungate scheme which includes 1,025 new homes for York – and where sale prices currently range from £160,000 for a one-bedroomed ground floor flat to £467,000 for a three-bedroomed apartment on the sixth floor. CiytLets York have been acting as specialist letting agents on the Hungate development, advising landlords on potential rental income and marketing properties to tenants looking for city centre apartments. Rising rents & more households renting means 2017 was a record year for total rent. Rents grew by 2.4% year-on-year, growing fastest in London/ Midlands /South West. The North sees healthy growth of 2.1% in Jan 2018, compared to previous Jan 2017. The amount of rent paid by millennials (born 1977 – 1995) falls 2%. 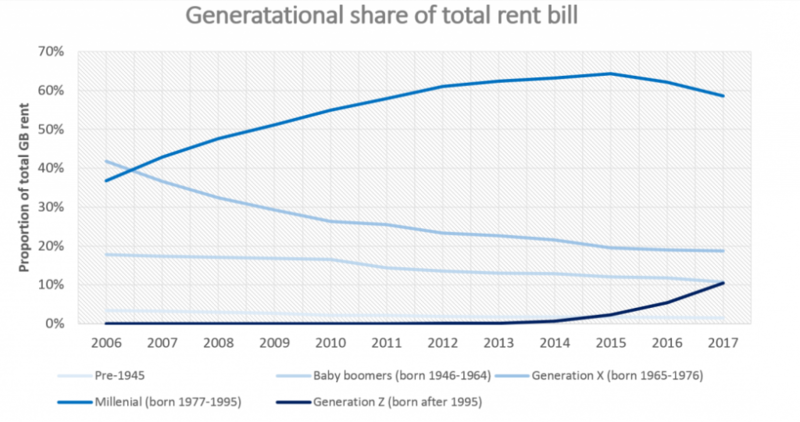 Generation Z (<23 years old) spends £5.5bn in rent, doubling over the last year, yet Baby Boomers retain their importance. Last year tenants in Great Britain paid a record £51.6 billion in rent, an increase of £1.8 billion on the previous year and more than twice what they paid in 2007, 10 years previous (see table 1). Overall rental growth has been driven by both rising rents and an increase in the number of households renting. Despite average rents falling in 2008, the total amount of rent paid by tenants has risen in every year for the last decade as the number of people renting has grown. For the last 11 years millennials (born 1977-1995) have been paying the majority of total rent in Great Britain. In 2017 millennials paid 59% (see chart 2) of all rent, a total of £30.2 billion (table 1). This is down from a peak of 64% in 2015 when they paid £31.0 billion. Today millennials account for a similar proportion of rent as they did in 2011 (chart 1). And as more millennials buy their own home, they will account for a shrinking proportion of the total rent paid. While together the two youngest generations make up the largest proportion of the rental market, older renters still make up a significant proportion of tenants. Despite a high proportion of baby boomers (born 1946-1964) owning their own home, many still rent. Last year this age group paid £5.5 billion (table 1), 10% of all rent, the same as generation Z (born after 1995). This can be explained by the fact that on average individual baby boomers tend to rent larger homes in more expensive places and pay more each month than any other generation. The rate of rental growth in January 2018 remains unchanged from the end of 2017. In January the average cost of a new let rose 2.4% from last year (table 2), unchanged from December 2017. Excluding London, average rents across Great Britain rose 1.9% (table 2), with the North (including Yorkshire) experiencing 2.1% growth setting a healthy start for the year ahead. In particular, Scotland, the South East and the South West saw growth rates slow and the North East was the only region to see rents fall. “The rental market grew in 2017. More people joined the rented sector and average rents increased, meaning 2017 saw the highest total rent bill so far. “As millennials age, more are becoming homeowners, so the total amount they’re paying in rent has started to drop. But the Generation Rent title still applies. Any fall will be much smaller and slower than seen by previous generations as less become homeowners.